This is a fun item. Hand free purse or tote. This Fanny Pack is Fun and Functional. 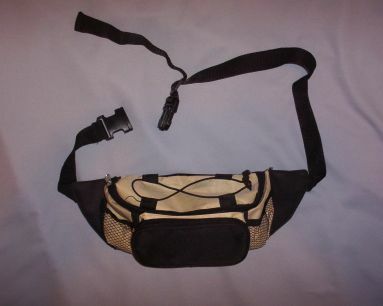 The photo below of the open Fanny Pack is mine to show what the pack looks like when tags are taken off and it is ready to use. 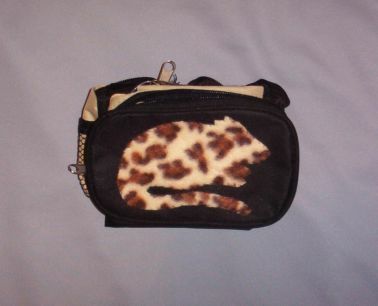 The Leapard Print polar fleece rattie cut out is hand sewn on to the Fanny Pack. This pack is tan and black, the black belt is very long on this pack. It closes with a black plastic quick release buckle. You could hand or machine wash this bag on the gentle cycle, but I would let it air dry. 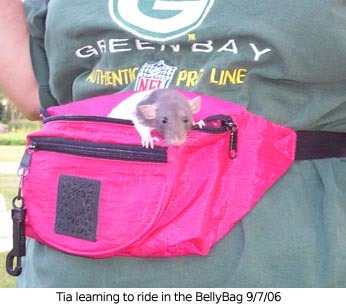 No two Rattie FANNY PACKS exactly alike. Please Note: Our items are nonreturnable and not refundable. If there is a problem with craftsmanship we will be happy to replace the item. This item is new and has never been or used around any animals.